very detrimental to your health. What do disc herniations, pain, arthritis, long term muscle strain and pinched nerves have in common? …Poor Posture. and preventable if caught in time. What causes poor posture? One biggie is the work station, how we use it and the fact we “freeze” our bodies in it all day. Step 1: Improve your ergonomics (also known as fit yourself into your workstation). Try sitting upright with your arms and legs at right angles. Raise or lower the keyboard, monitor and seat height to achieve these ‘right angles.” Keep your lower back curve relaxed so it is neither too arched, flat or back up against the chair. This promotes proper back muscle usage, which prevents disc pressure and makes your back stronger. Try this posture for 5 minutes per hour the first week and slowly build over time. 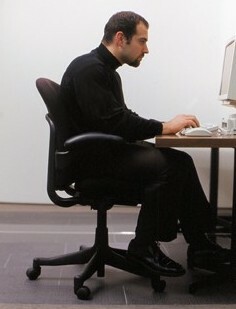 You will create a new and healthier way of sitting at your work station. Step 2: Micro breaking (2-5 minute breaks, every 30-45 minutes) entails walking, stretching or any movement at your work station that does not involve “work.” I.E. – Do some shoulder stretches, seated chair twists, stretch arms, wrists and fingers, or walk around the office – all with deep breathing. Also close your eyes for a minute or two to rest them. They don’t like staring at a pc screen! Step 4: Get sufficient movement every day outside of work. Modern living denies these two ingredients to good posture. Take Yoga or Pilates classes and have a home practice. Find a good personal trainer at your gym who can show you how to lift weights in a manner that promotes good posture. Nourish your body with healthy movement and it will support you for years to come. Step 5: have a healthy and positive attitude in making these changes to your workstation, habits at the workstation and your exercise outside of work. Consciously choosing this attitude will make the shift easier, faster, and more enjoyable.